Unroll dough sheet onto cutting board, and reshape into 12x8-inch rectangle. With pizza cutter or sharp knife, starting on short edge, cut dough into 8 (12-inch) strips. Working with one strip at a time, roll slightly into 12-inch rope. 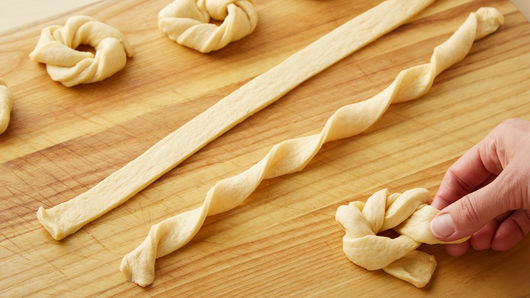 Make small loop on one end, creating short tail and long tail of dough. Wrap long tail of dough around loop 2 to 3 times. Wrap short tail of dough around edge of loop, and tuck through center, pinching to secure, creating wreath-shaped roll. Place onto cookie sheet, and gently press dough almost together in center, leaving a small well in center. Repeat for remaining dough. 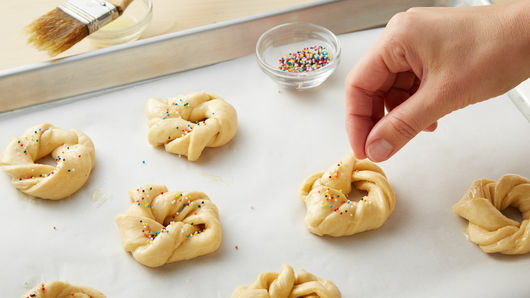 Brush tops of dough rolls with melted butter, and sprinkle with nonpareils and granulated sugar. Bake 9 to 12 minutes or until golden brown and dough is baked through. Remove from cookie sheet; place on cooking rack. Cool completely, about 30 minutes. In small bowl, mix powdered sugar, softened butter, vanilla and 4 teaspoons milk with spoon until mixed well. If necessary, add additional milk to make frosting smooth and spreadable. 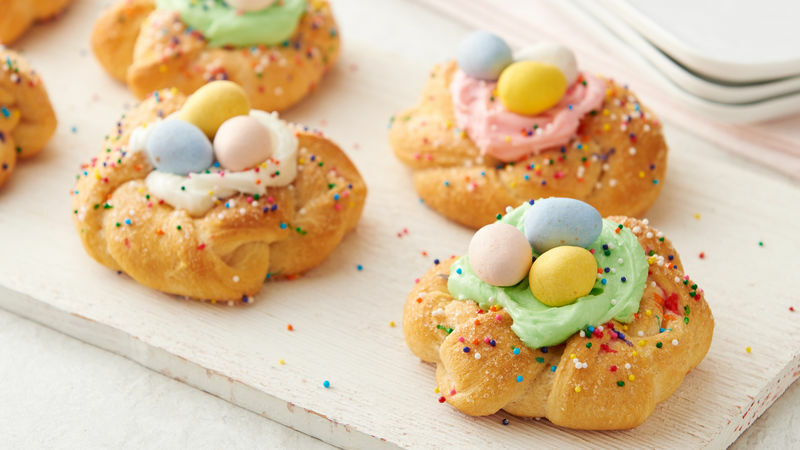 Spoon 1 heaping tablespoon of frosting into center of each wreath; top with chocolate eggs and additional nonpareils. For added color, tint the frosting with desired food colors before adding to wreaths. Jelly beans are a great substitute for candy-coated chocolate eggs.